Angela Chase is a Montreal-based writer and translator whose credits include a critically-acclaimed translation of The Award (La Médaille) by Lydie Salvayre. Wholly Unmanageable is her first memoir. (I originally wrote this period-based memoir to expiate the anger I felt at the treatment I received during my first and only experience of in-house rehab. But then, as a famous author once expressed it, you quickly realize that you cannot tell your story without telling the "whole story.") I also offer some alternate takes on 12 Step reality. 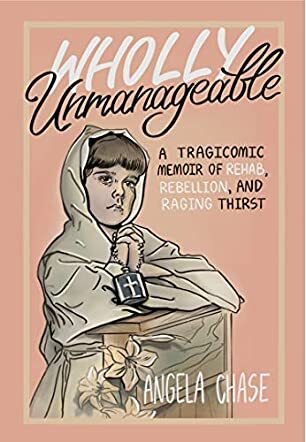 Wholly Unmanageable is a heartfelt memoir by Angela Chase, self described as ‘A tragicomic memoir of rehab, rebellion and raging thirst’. Focusing on the extreme difficulties of living with alcohol addiction, this is the story of Angela’s visit to Paterson Place, an Ottawa rehab that was nothing like it promised to be. Hellish counselors Gabe and Gill took Angela through some horrifying experiences in a setting nothing like the fancy celebrity rehabs you see on television, yet through it all this struggling older woman gave her life humor and even optimism. The tale overall takes life by the horns, turning a tragic situation into a message of solidarity and small victories for her readers. Angela Chase writes with raw honesty and a dialogue straight from the heart that was sometimes hard to read purely for the candor of it. That said, her personality came across so endearingly on the page, garnering sympathy for a woman who fell into the happiness illusion trap that the world sets up for us, seeking it anywhere that promises it, until she ended up at the bottom of the bottle. There’s great pathos and wit throughout the narration, but also some very powerful observations on life and the nature of happiness itself. I think readers don’t need to have been through a similar experience to ‘get’ this book, because the quest for false cheer is one whose sting we have all felt in our own way. Wholly Unmanageable is a highly recommended memoir for readers who appreciate the irony of jumping out of the frying pan into the fire.